An important artifact of early biblical archaeology has a new owner after a fierce bidding war. The world’s earliest known tablet of the Ten Commandments sold at Heritage Auction November 16 in Beverly Hills for $850,000. The lot opened at $300,000, a 50% premium to the $200,000 reserve. Two telephone bidders battled to the ultimate sale price, and so far the winner has wished to remain anonymous. Known as the Yavneh Ten Commandments Stone, the two-foot square white marble slab weighing 200 pounds, the table is inscribed with 20 lines of Paleo-Hebrew characters rendered in Samaritan dialect. The punctuation and distinctive rendering of the Samaritan letters led scholars to date the tablet to the period between the fourth and eight centuries A.D.
“The first two lines form a dedication, the second line of which is underlined to distinguish it from the 18 subsequent lines. 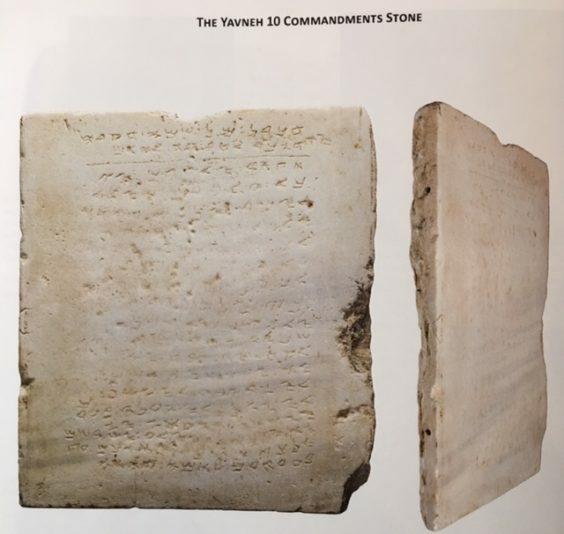 These contain the Mosaic 10 Commandments in the form used by the Samaritans, with an additional admonition to build a temple on the holy mountain of Gerizim, now located near the West Bank city of Nablus,” according to Heritage. Scholars have suggested the slab once originally adorned the entrance to a synagogue that may have been destroyed by the Romans or during the Crusades. It is first documented in a scholarly report published in 1947 by the Jewish Palestine Exploration Society which recounts the slab being first uncovered in 1913 during railroad construction along a southern coastal plain of Palestine. The workmen, unaware of the importance of the tablet, apparently sold it to a local wealthy Arab gentleman who set the stone in the threshold to his inner courtyard. Foot traffic over the ensuing three decades smoothed the center portion leaving the inscription difficult to read in areas. The stone table was consigned for sale by Brooklyn-based Living Torah Museum established by noted American Rabbi Saul Deutsch. The Israel Antiquities Authority (IAA), which granted export approval for the object in perpetuity to Deutsch’s Museum, consented to the sale on the condition that the tablet be placed on public display “where all can view it and enjoy,” according to the auction house.